I created these invitations, thank you notes, and favor tags and printed them at home. 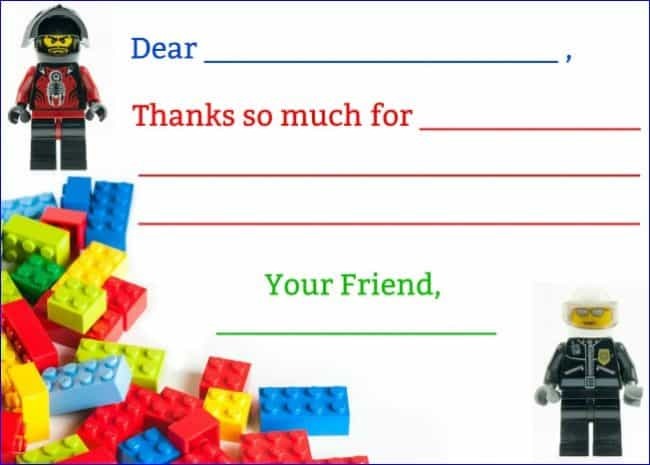 The invites can be sent out via text or email, and the thank you notes are mailed after my son completes them. You can download a blank version of each of these at the bottom of this post! 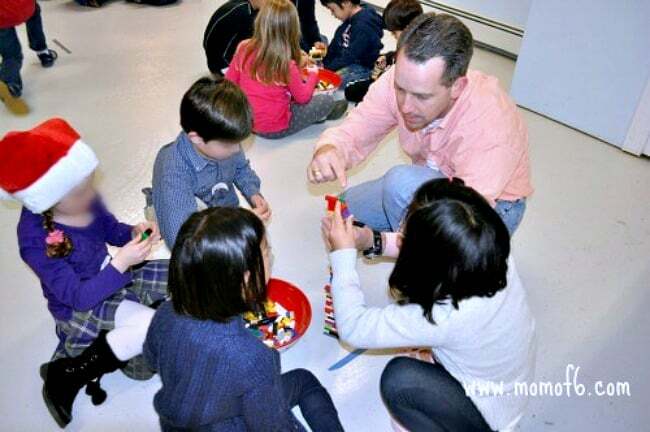 Fortunately, we have a semi-finished basement where we can host get-togethers like this for the kids, and where the kids can run around and play when the weather is bad. 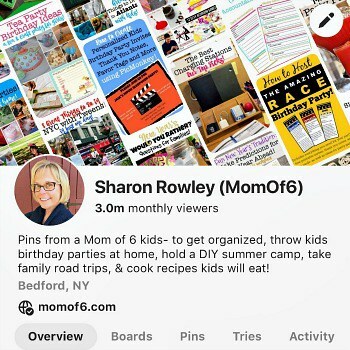 And long ago, we invested in some folding chairs This is an affiliate link: MomOf6 earns a commission if you purchase, at no additional cost to you. 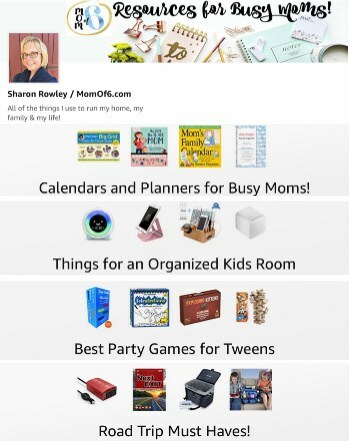 and tables This is an affiliate link: MomOf6 earns a commission if you purchase, at no additional cost to you. 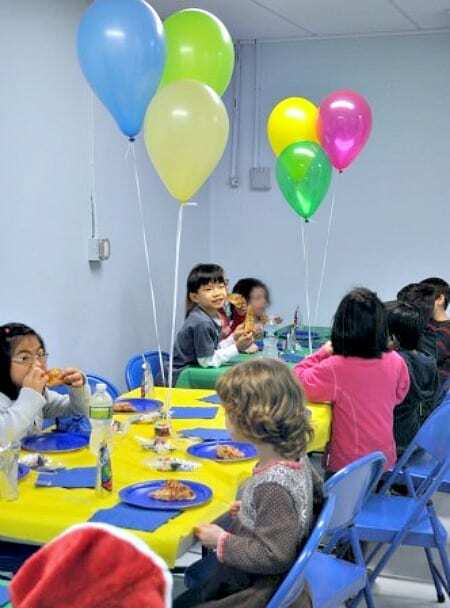 that we can use for our parties. So we set up the room with the tables and chairs pushed to one side so we had enough room for games on the other. Tables were covered in plastic table roll This is an affiliate link: MomOf6 earns a commission if you purchase, at no additional cost to you. 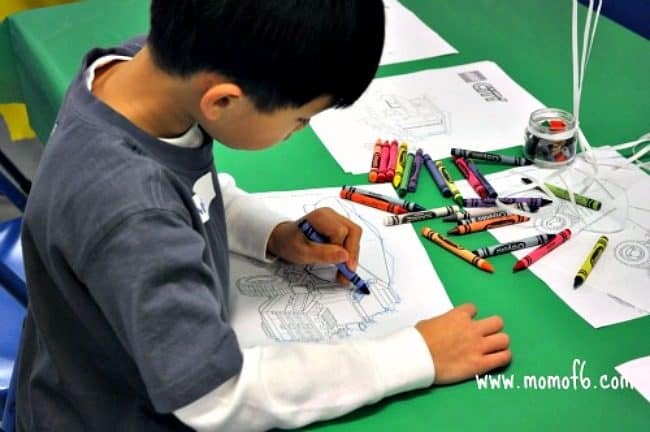 (it makes the room look festive and it is super easy to clean up afterward), and on top were coloring pages that I downloaded for free from Lego's website. 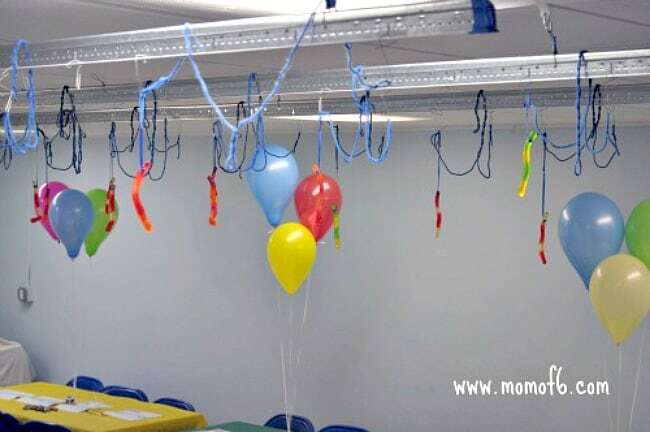 I like to have an activity for the guests to do when they first arrive, that provides newly arrived partygoers an easy way to join in on the fun. 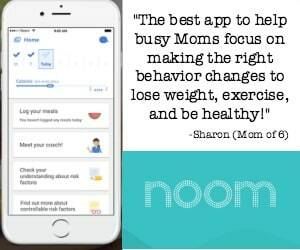 In the past I used to lead the kids in “Simon Sez”, but I've learned a few things over the years! First of all- some kids feel a little shy at first and it is hard for them to jump into such a silly game until they have had time to warm up, and secondly- for the non-shy kids- it waaayyyy amps them up. And now you have a jumpy excited kid who has a hard time settling down for the “real” party games! 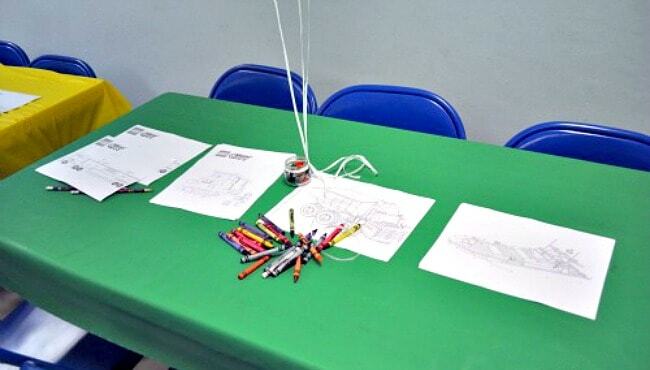 So this time, we tried coloring pages, and it worked perfectly! Next I grouped the kids together (no picking teams!) 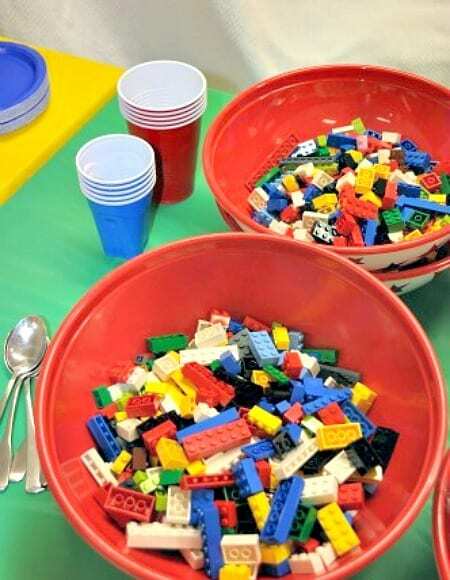 and set them up for a Lego relay race, where they had to scoop up Legos onto a spoon, race-walk to the other end of the basement and dump them into a cup. The first team to fill up their cup won! I then had the same teams sit down with a big bowl of Legos, and asked them to build the tallest tower they could- but it had to be able to stand on its own- and they needed to work together as a team to build it! 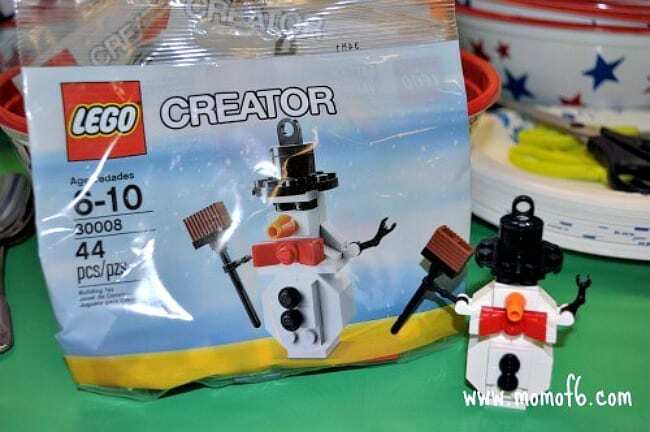 After that, we headed back to the tables where Steve led the kids in making this adorable Lego snowman from a kit This is an affiliate link: MomOf6 earns a commission if you purchase, at no additional cost to you. ! 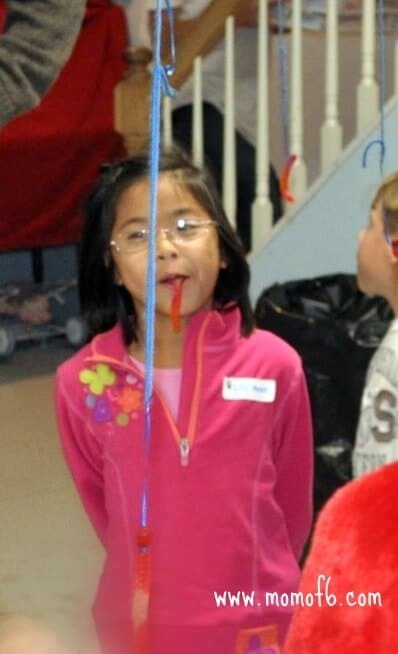 We ended our party games with the worm on a string game- where the kids have to eat the gummy worm off of the string without using their hands! Kids LOVE this game! Then it was time for pizza and cake! This was a simple cake that I pulled together by baking a sheet cake, and then cutting the cake into slices- longer ones would be 1×4 Lego bricks and smaller slices 1×2 Lego bricks. I used colored fondant This is an affiliate link: MomOf6 earns a commission if you purchase, at no additional cost to you. to make the bumps on the top of the Lego bricks (I just rolled out the fondant and used a small biscuit cutter This is an affiliate link: MomOf6 earns a commission if you purchase, at no additional cost to you. to cut out the circles). 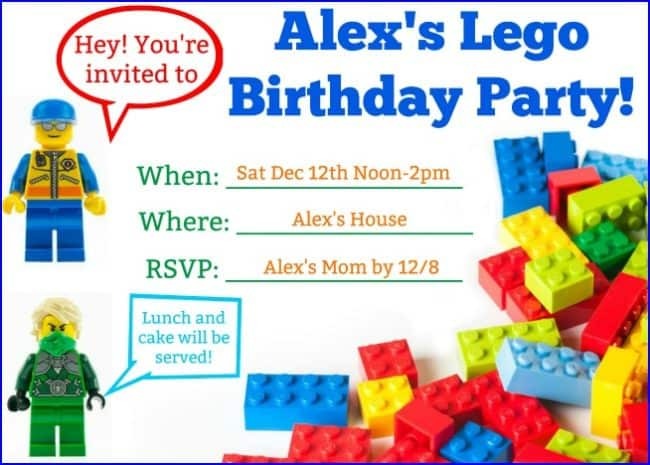 And of course we topped the cake with these cool Lego candles This is an affiliate link: MomOf6 earns a commission if you purchase, at no additional cost to you. ! How happy does Alex look surrounded by his brothers and sisters? And of course, no party would be complete without handing the guests a goodie bag as their parents arrive to pick them up. 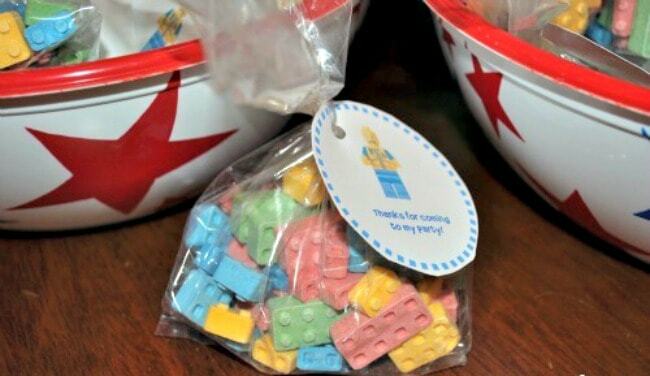 Our goodie bag was filled with Lego brick candy This is an affiliate link: MomOf6 earns a commission if you purchase, at no additional cost to you. 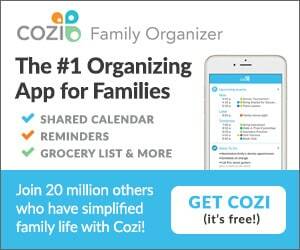 – and you can actually build with it! How great is that? 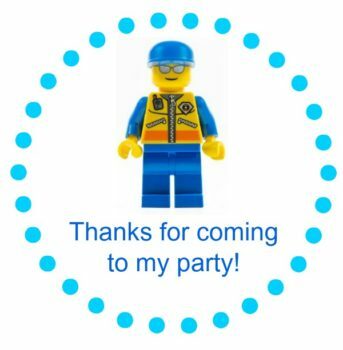 It was truly such a great party- even I had a nice time too! 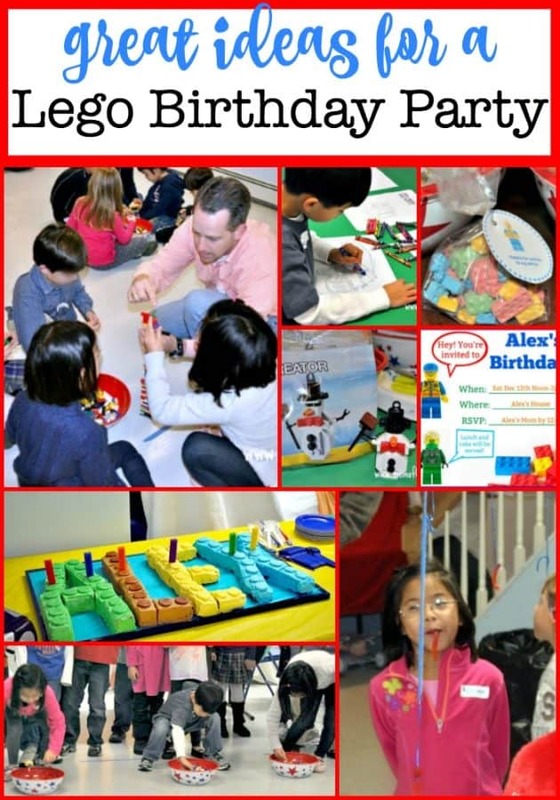 Have I inspired you to plan a Lego birthday party too? 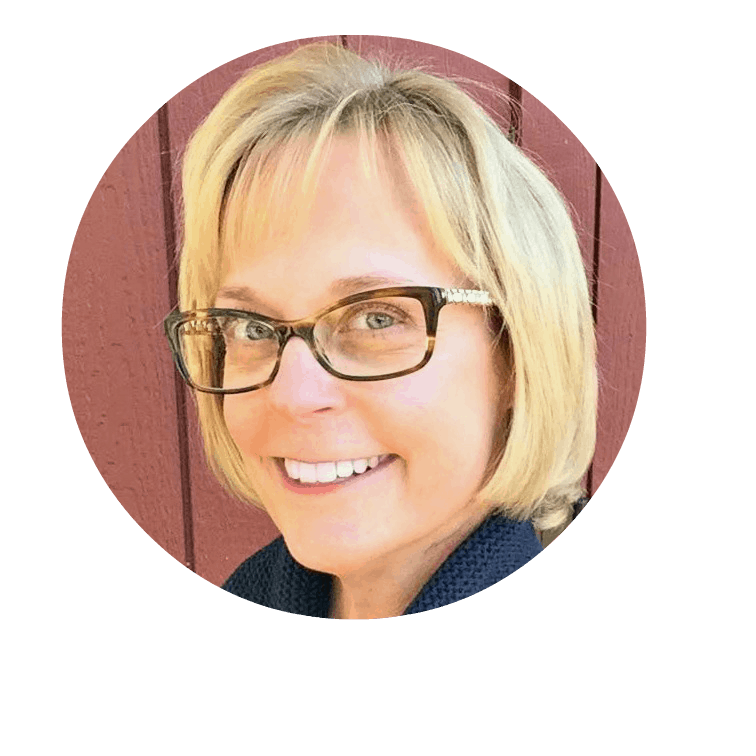 I would love to hear about it- please leave a comment! The blog you found that invitation is at http://allisonwaken.squarespace.com/allison-wakens-blog/2010/10/27/lego-party-part-1-the-invitation.html. 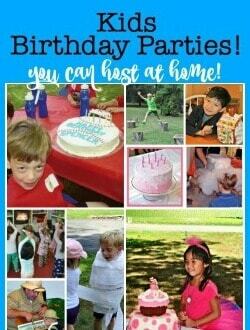 I used her free printable for my son’s 5th birthday invites. So cute! Thank you SO much for providing the link! I felt awful that I couldn’t attribute proper credit to the person who worked so hard to create these adorable invitations! 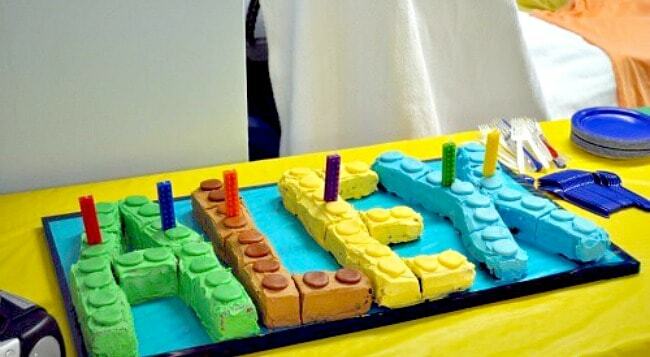 Best Lego cake EVER! Good thing he has a short name. Amazing that you pulled this off during the holiday season. Really puts my minivan party to shame, LOL! Thanks Christine! You’re right- we’re lucky Alex only has 4 letters in his name…. or I probably would have just spelled Lego! And it is really hard to pull off a party during the holidays…. but I just kept thinking of how much it would stink to have your birthday so close to Christmas and get all of your gifts for the year in a two week span! So I just wanted it to be special for him! WOW!! 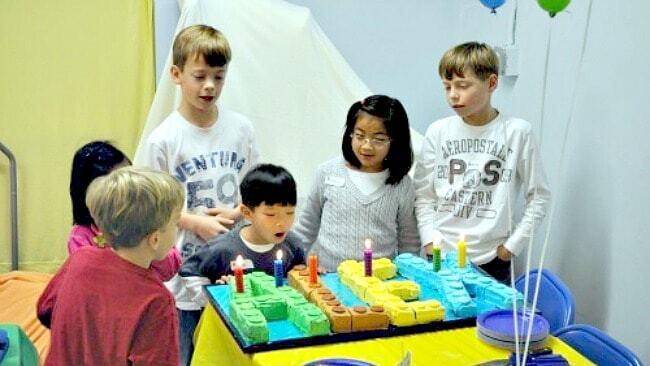 The cake looks great, and Alex looks so happy. Wish we could have been there. You are amazingingly creative. Thanks! I find so much inspiration from things that I find online! But I have to say that this cake was mostly a unique creation!